Many Belarusians who decided to greet the New Year watching Belsat TV channel were disappointed. In the last minutes of 2011, instead of entertainment or good wishes, Belsat exposed them to a cold shower of videos of the April Minsk terrorist attack, political prisoners and graphic images of police cracking down on post-election protests. This was not just an editorial mistake, but a typical weakness of an underfunded broadcasting project. Belarusian exile media suffers from technical and professional weaknesses and lacks sufficient funding. Although recently Western funding has somewhat increased, the bulk of financial burden of broadcasting to Belarus is borne by the United States and Poland. Another Belarusian neighbor, Lithuania, apparently will not risk worsening relations with Lukashenka. For instance, the Baltic Waves radio station project broadcasting to Belarus from Lithuania between 1999-2001 with the help from the United States was short-lived. Currently one TV channel (Belsat) and three radio stations (Euroradio, RFE/RL and Racyja) broadcast on a daily basis to Belarus from the West. However, their coverage and financing is incomparable to that of Belarusian state media propaganda. Starting this January, even the harmless Russian edition of the Euronews channel has been excluded from the standard cable TV package in Minsk. Entertainment programs produced by Russian TV channels almost completely dominate the Belarusian media landscape. Belsat TV, the only Belarusian-language TV channel, broadcasts from Poland and is undoubtedly the most important exile media. In June 2006, the Polish Foreign Ministry and Polish Public Television signed an agreement on the long-term development and financing of Belsat. The channel went on air in December 2007. In 2009, internal conflicts in Poland threatened its future when the Polish Public Television announced that it would not finance Belsat anymore. Fortunately, the channel is still alive, and its importance is growing. 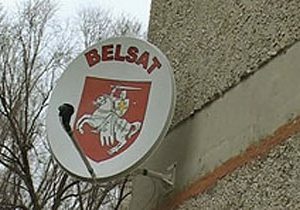 The Belarusian authorities initially feared Belsat and even launched a wide-scale campaign in the country to register and effectively ban individual satellite dishes. Then they apparently decided that Belsat presented little danger for the regime and stopped prosecuting the owners of satellite dishes. However, the regime continues to put pressure on Belsat journalists. Unlike other projects of foreign broadcasting to Belarus, Belsat has no official office in Minsk and its journalists cannot get official accreditation. That makes them an easy target for regular persecution by the Belarusian authorities. Scarcity of funds is one of the main problems faced by Belsat. The channel had to build up its facilities and a network of correspondents from scratch and needs to do much more to train its staff. Currently Belsat is a heavy burden for Poland both in political and financial terms. Strengthening multilateral support for Belsat would reduce Polish dominance on the channel and improve its credibility among Belarusians who still remember old historical grievances between the two nations. Belsat cannot afford to purchase enough good quality foreign movies and programs. As a result, old Polish movies constitute much of its content. This reduces its appeal to the average Belarusian. Perhaps the Western media and institutions could allow Belsat to use their products free of charge or for a symbolic fee. They would hardly lose profits were Belsat to dub some movies into Belarusian and broadcast them in a country where the copyrights are not implemented anyway. The other joint US-Poland project is European Radio for Belarus. It has been broadcasting since February 2006, mixing political, social, cultural and other information with extensive modern music and entertainment programs. At its inception, the project won a tender from the European Commission and that ensured its funding for two of its most difficult initial years. Euroradio runs a lot of original stories and focuses on simplicity. Moreover, it avoids over-politicizing its content, offering social and life-style information interesting to regular Belarusians instead. Euroradio manages to cover its own unique themes because, besides Warsaw's central office, the radio has an office in Minsk and a considerable network of reporters. It also succeeded in using new media such as Twitter to broaden its audience base. The oldest broadcaster is Radio Liberty/Radio of Free Europe, financed by the United States. Its Belarusian program started in 1954 and became legendary in Soviet times. Headquartered in Prague, Radio Liberty broadcasts eight hours a day and is well known in Belarus. Today Its website is probably better known than its airwave programs. Radio Liberty is conservative in its work and format. It has certainly lost some of its audience by excessively focusing on negative, anti-regime content. In February 2006, another radio station on Polish territory – Radyjo Racyja – resumed work. Radyjo Racyja's ambitions are smaller than those of other projects due to limited funding. Initially, Radio Racyja targeted primarily the Western regions of Belarus. Now it attempts to reach all Belarusians. But because Racyja is located in the Polish city of Bialystok, a region with a traditionally large number of ethnic Belarusians, Western Belarusians remain its primary listeners. In 2005, the European Commission granted German Deutsche Welle (DW) the symbolic sum of 138,000 euros to organize programs for Belarus for one year. The Belarusian project at DW failed, and only a tiny Belarusian section, a part of DW's Russian Service, continues to operate. DW's Belarusian programs were broadcast in Russian with short Belarusian fragments. The DW content often had a pro-Russia bias, perhaps because the programs were made by people from Russia rather than Belarus. This is particularly evident in DW materials on relations between Belarus and Russia. The short-lived DW broadcasting for Belarus demonstrates the failure of attempts to consider Belarusian matters in the context of a Russian framework. The Belarusian exile broadcasters would benefit from better financial support, enhanced connection with their audience in Belarus and experimenting with new forms of Internet-based products. Some of the current projects, in particular Belsat, appear to be chronically underfunded. Funds allocated to the democratization of Belarus could be redirected to the media sector. At the same time, the media in exile should improve their interaction with the Belarusian audience. It is very important to ensure that the projects do not live in a foreign bubble. In 2008, Belsat established a Public Council consisting of prominent Belarusian intellectuals whose task was to supervise and consult the channel in order to improve its performance and appeal to Belarusians. Unfortunately, the council's activities are either kept secret or do not exist. Finally, the exile media should seriously consider the newly available forms of Internet communication. For instance, Russian radio stations such as Ekho Moskvy broadcast their programs not only in radio format but also as videos on the Internet. Radio Liberty has already started a joint program with Belsat, but more should be done to respond to the growing number of Internet users in Belarus. Tags BBC Belarus-Lithuania Belarus-Lithuanian relations Belarus-Poland Belsat DW Euronews European Radio for Belarus Media Poland Racyja Radio Libery RFE/RL RFE/RL Inc.